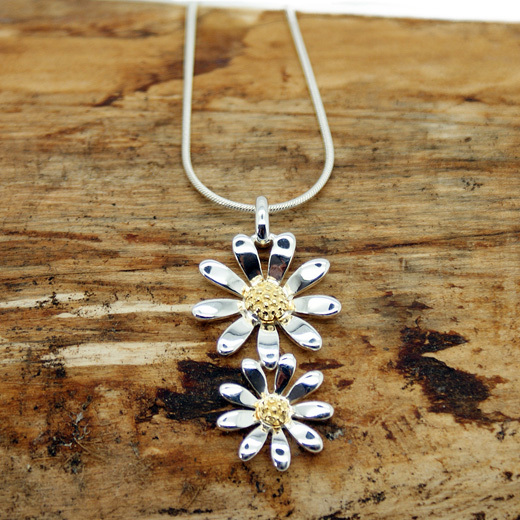 A beautiful daisy pendant and chain from RP Designs. This well made daisy necklace has a 13mm lower flower and a 18mm top slower both made of sterling silver with a gold plated centre. 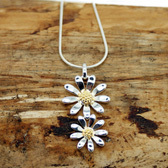 It is set on a 42cm / 16.6 inch sterling silver chain with a lobster clasp. 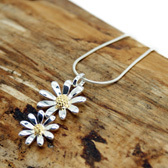 A truly lovely piece of jewellery suitable for day or evening wear, it would make a lovely gift. 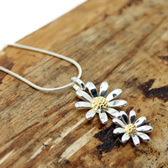 We also have a bracelet and earrings to match this necklace here. A high quality daisy necklace and great value. Like all of our products, it is brand new and in stock in the UK, ready for our super fast shipping.